Winston Churchill or anglophile newborn? Last week my family got a little bigger… we all gained weight. Thank you, thank you, I’ll be here all week… try the veal. My brother-in-law and sister-in-law had their first child, a beautiful baby girl named Marlo Isadora. Everybody is getting along just fine, aside from common baby-type stuff that I don’t know enough about to comment on. I spent much of the labor monitoring the situation in the hospital waiting room. Who better to oversee the waiting process than someone who’s spent the last seven months waiting for employers to call? That’s right, no one. I’m the best. It says so right on my resume. And that’s why they pay me the big bucks, or at least they would if they ever hired me. Marlo looked sort of like Winston Churchill with more hair at first, proving once again that all newborn babies look like Winston Churchill. 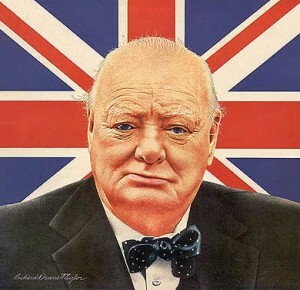 (And for those paying attention, I did just imply that Winston Churchill is beautiful.) She’s already growing out of that, to everyone’s relief except, perhaps, her own. People think she cries because she’s hungry or needs changing. I maintain that she cries to lament her changing looks. Really, who wouldn’t want to look like Winston Churchill for as long as possible? She has the rest of her life to look like her parents or herself. The beauty of having a baby in the family – besides, you know, the baby – is that everyone forgets about everything else for a little while. Life is boiled down to its essence… life, nothing more and nothing less. My unemployment has been an ongoing topic of family conversation for months and months. No one has pestered me, no one has interrogated me. In fact, I very much appreciate everyone’s handling of it. Being a major part of my life, unemployment still comes up frequently in conversation. Even though I’m completely over it, I don’t have much else going on. But all conversations lately seem to involve the baby and how she’s doing. Since Marlo’s arrival, I haven’t had a single unemployment conversation with family. She hogs the spotlight. I know distraction wasn’t her sole reason for being born (possibly number three with a bullet), but I appreciate the gesture just the same. Marlo will be getting a teddy bear or snow cone for her troubles, when she’s old enough to appreciate the finer things, like teddy bears and snow cones. Maybe I’ll even offer up a couple embarrassing stories about her parents from my vast store. Marlo’s arrival even made me forget about my own problems for a little while. That means she did right by me twice and I owe her a second teddy bear or snow cone; kids really start fleecing their elders early these days. The curse of temporarily forgetting, at least for me, is eventually remembering. All the problems came rushing back the next day, with twice the impact and all sorts of other debris caught up in the current. One particular question floated to the top and continues to stick with me. How can I ever have and support a kid if I can’t find, let along keep, a job? I don’t have the answer. I may not fully understand the question. And that bothers me… a lot. This was written by Norm. Posted on Tuesday, June 9, 2009, at 11:00 pm. Filed under Feeling Sorry for Yourself, Job Search, Unemployment. Tagged Marlo Isadora, snow cone, teddy bear, Winston Churchill. Bookmark the permalink. Follow comments here with the RSS feed. Both comments and trackbacks are currently closed. Congrats to the family on the new addition. not sure who actually had it since you were quite cryptic enough there… I guess on her side. By the way, noticed some ads floating around here- hope that means your site has reached ad worthy levels!